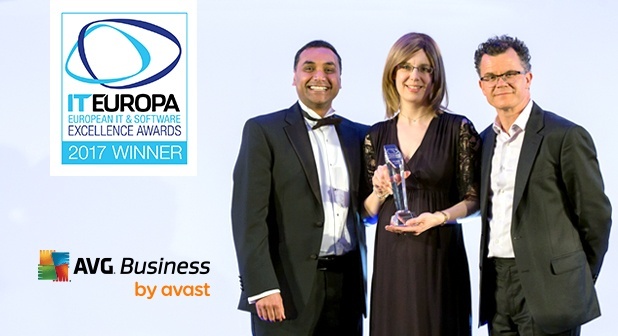 AVG Business by Avast proudly accepted the "Security Vendor of the Year" award at the European IT & Software Excellence Awards held in London on March 30. The annual awards is the leading pan-European awards for resellers, ISVs, Solution Providers and Systems Integrators, and their vendor and distributor partners. Avast's PR Director, Stephanie Kane, accepted the award on behalf of the AVG Business team. Run by top European channel publication, IT Europa, the awards are in their ninth year. More than 500 entries were received this year with 154 finalists vying for just 26 trophies, so the competition was fierce. The Security Vendor of the Year award recognizes best practices in customer solutions, as well as service excellence from vendors and distributors. “The investments we have begun to make this year in rigorously improving our products and expanding our partner program offerings will lay the foundation for another year of joint success that we believe will enable us to win more such industry awards in the future,” said Chapman. “We look forward to maintaining a strong relationship with IT Europa, a publication that has been instrumental in keeping AVG Business by Avast in the minds of our channel partners and end users."